Bob Reitz works in the production department at the University of Nebraska Press. He's one of the many people at UNP who taught me so much while putting up with all of my newbie questions. My first job was at the Journal-Star newspaper. I was hired as an apprentice. Back then it was known as hot metal, the stories were set a line at a time on a Linotype machine using melted lead. I also made up pages and learned to set type on the Linotype. After about five years the paper made the move to what they called cold type—setting type on film. We typed the stories on a typewriter-type machine that punched out ticker tape. From there the tape was read by a typesetter which produced film that was developed, dried, and then cut out and waxed to be pasted on page-size grids. Typesetter, compositor, or imagesetter—do you have a preference? What the heck do they mean (what’s the difference)? Today I’d have to say were more like graphic designers. Saying typesetter to me implies you set type, compositor is one who composes the text or pages up a book, and imagesetter—I’m not to sure what they mean by that because we do more then set images. Would you list (and maybe briefly explain) the different typesetting technologies you have used? This could be difficult—many of the older processes were similar, but with improvements of machines or typesetting equipment. I’ve set type one letter at a time, one line at a time on the linotype machine, and using the ticker tape to produce whole stories. Today we use computers which can have a variety of typesetting software installed. I’ve used a programs named Magna, PageMaker, TeX, and now I’m using InDesignCS3. Magna set a page at a time which you sent to a typesetting machine which produced film, which was developed and sent to the printer. PageMaker and InDesign are very similar but I believe that InDesign is the industry's choice today. TeX was probably the fastest program I ever used: it was designed for setting math books, but was found to do a great job just setting text. This is a hard question to answer. My favorite would be a combination of TeX and InDesign, using TeX’s speed and InDesign's great handling of photos and graphs. Since that’s not possible I’ll have to say InDesign would be my favorite. Once one gets the hang of it it works well. I especially like the way it handles graphics. What do you think about having to learn all of them? What have you learned in the process? Learning them was at times a challenge especially when I first started—the linotype was big and noisy and a real challenge to an 18-year-old kid. But most of the programs were a step forward, they did different aspects faster or easier. What have I learned? I’m trying to remember, lets see. I guess I would say that all new programs are usually a step in the right direction. They may do several things better or faster, in the process sometimes things that one used before are no longer a part of the program, which makes you wonder. There are times when I ask myself if the writer of the program even thought of asking someone who would actually use it for any input. Me thinks not. Of the books you’ve worked on, do you have a favorite? I can’t say that I have a favorite. Although I really enjoyed working on Dueling Chefs. It was a challenge and fun to put together. I’ve also tried some of the recipes which are very good. I actually finished this one a while back. If you recall, I ended up being really disappointed in her first book. Because of that, I hadn't planned to read this when I first heard about it. Then I read this review. And thought about how much promise In the Woods showed. I'm glad I decided to read it because this one did not disappoint. It isn’t until Cassie sees the body that she understands Sam’s insistence. The dead girl is Cassie’s double, and she carries ID identifying her as Alexandra Madison, an alias Cassie herself used years ago when she worked undercover. The question becomes not only who killed this girl, but who was this girl? Since I finished this I've started reading Field of Blood by Denise Mina and I'm seeing a lot of similarities between these two authors. 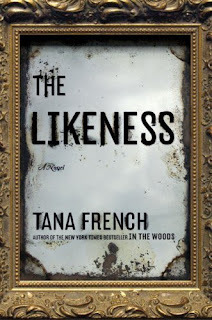 I'm not the only one—this blogger compares Mina, French, and Val McDermid. Are you a fan of great book covers? Yes? Then I recommend you head right over to The Book Cover Archive: An Archive of Book Cover Designs and Designers. You can browse by designer, title, author, art director, photographer, illustrator, genre, publication date, or publisher. What more could you want? What's that? A blog, you say, to go along with the archive? Here you go: the Book Cover Archive Blog. A broad overview of the book publishing industry: past, present, and future. Old Publishing is stately, quality-controlled and relatively expensive. New Publishing is cheap, promiscuous and unconstrained by paper, money or institutional taste. If Old Publishing is, say, a tidy, well-maintained orchard, New Publishing is a riotous jungle: vast and trackless and chaotic, full of exquisite orchids and undiscovered treasures and a hell of a lot of noxious weeds. Not that Old Publishing will disappear—for now, at least, it's certainly the best way for authors to get the money and status they need to survive—but it will live on in a radically altered, symbiotic form as the small, pointy peak of a mighty pyramid. If readers want to pay for the old-school premium package, they can get their literature the old-fashioned way: carefully selected and edited, and presented in a bespoke, art-directed paper package. But below that there will be a vast continuum of other options: quickie print-on-demand editions and electronic editions for digital devices, with a corresponding hierarchy of professional and amateur editorial selectiveness. (Unpaid amateur editors have already hit the world of fan fiction, where they're called beta readers.) The wide bottom of the pyramid will consist of a vast loamy layer of free, unedited, Web-only fiction, rated and ranked YouTube-style by the anonymous reading masses. I finished reading this one a week ago or so. 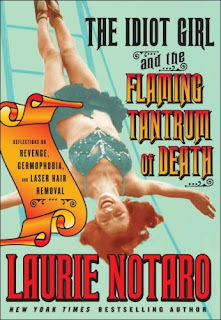 It was one of the first books I purchased and downloaded all on my Treo 700p from m.ereader.com. Previously I had been browsing, shopping, paying, and downloading onto my PC and then uploading to my phone. I'm very pleased with this new ability: browsing is reasonably speedy (especially considering that their non-mobile site is a little sluggish), and the shopping cart and downloading process worked smoothly. Hadn't one of my all-time favorite reveries been to become a cranky hermit, live unperturbed in my house, and have things brought to me like a monarch or a tribal lord? Because, really, who wants to be twenty again, I thought, living in a house with a bunch of dirty guys and a snake? . . . Don't get me wrong. I loved the reckless abandon of my younger, skinnier, prettier, poorer days, but doing all of that once in a lifetime was pretty much enough. Hilarious. Well done, Macmillan digital marketing team. 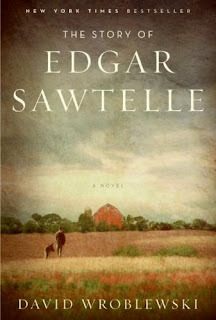 I read The Story of Edgar Sawtelle as an ebook from eReader. I didn't know much about it before I bought it. It seems like one of those books that, out of nowhere, I started hearing about all over the place. Holy cow do people love this book. In the New York Times, Janet Maslin called it "the most enchanting debut novel of the summer." It was one of Oprah's picks and she has "a webcast event" with the author coming up on Jan. 26th. At first I don't think I was giving this book the attention it needed and deserved. At times I found myself feeling a little restless or distracted reading it. I blame myself—I didn't correctly match the book to my mood. Also, it probably wasn't a good book for me to read on my Treo because I usually reserve those books for short reading sessions when I'm killing time. I ended up setting this aside for a few days while I read something else. During that time I unexpectedly found myself thinking about Edgar and the dogs, wondering where things were going. Once I gave it some dedicated time, I really enjoyed The Story of Edgar Sawtelle. My pal Amy tried to give me a copy of this book for Christmas. I say "tried" because of course I have it (and have read it). Her first clue should have been the subtitle: The Curious Lives of Human Cadavers. If that doesn't say "Jana" then I don't know what does. Anyway, I love this book so much. I just about swoon whenever it's mentioned and have to take a deep breath before I can speak. It's incredibly graphic, gross, and hilarious. Mary Roach asks every oddball question that pops into her head, even if it makes her look like a creep. I heart her. I told Amy to keep her copy and I would re-read mine along with her. And I almost never re-read books. I can't think of the last time I did that—maybe Do the Windows Open? Perhaps surprisingly, I haven't ready Roach's other books: Spook and Bonk (And I don't own them. Hint-hint, Amy). "Uproariously funny" doesn't seem a likely description for a book on cadavers. However, Roach, a Salon and Reader's Digest columnist, has done the nearly impossible and written a book as informative and respectful as it is irreverent and witty. From her opening lines ("The way I see it, being dead is not terribly far off from being on a cruise ship. Most of your time is spent lying on your back"), it is clear that she's taking a unique approach to issues surrounding death. 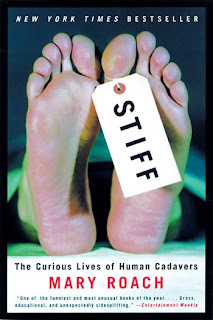 Roach delves into the many productive uses to which cadavers have been put, from medical experimentation to applications in transportation safety research (in a chapter archly called "Dead Man Driving") to work by forensic scientists quantifying rates of decay under a wide array of bizarre circumstances. There are also chapters on cannibalism, including an aside on dumplings allegedly filled with human remains from a Chinese crematorium, methods of disposal (burial, cremation, composting) and "beating-heart" cadavers used in organ transplants. Roach has a fabulous eye and a wonderful voice as she describes such macabre situations as a plastic surgery seminar with doctors practicing face-lifts on decapitated human heads and her trip to China in search of the cannibalistic dumpling makers. Even Roach's digressions and footnotes are captivating, helping to make the book impossible to put down. I don't have any resolutions this year. Usually I have something in mind, even if I don't think of it specifically as a resolution. I can think of some I should have: post here more regularly, exercise more, eat better, blah blah blah. Boring. Let's just leave it at this: I'll do what I can.